T.H. Stone Memorial St. Joseph Peninsula State Park reminds me of a commercial that used to be on local television, the tagline of which went something like: long name, amazing results. That’s how I felt about birding at T.H. Stone. My husband and I had been fishing nearby for most of the day, making the short 45 minute hop over to the state park near Port St. Joe in Northwest Florida. We arrived about 30 minutes before darkness – just enough time to set up our tent in our reserved campsite before heading out once again for dinner. Our location was gorgeous, surrounded by live oak and slash pine trees. Through the woods we had the bay on one side and the Gulf of Mexico on the other, sandy trails weaving between the two. Though we were technically in the Eastern Time Zone, we camped so close to the line that our cell phones continually switched back and forth between Eastern and Central. Fairly exhausted after a day of fishing, we had a delicious dinner at nearby Coneheads before quickly falling asleep. The next morning, we woke up at dawn to a chorus of birdsong. Literally, it was impossible to go back to sleep the cacophony was so intense. Gray Catbirds and Eastern Towhees and Northern Cardinals and more blended together in a swell of sound. After rolling out of bed, my husband and I opted to explore a trail that began just behind our campsite. We walked completely surrounded by birds, and I loved it. Overhead soared a Bald Eagle, Great Blue Heron, and Osprey; in the pines twittered Carolina Chickadees, Brown-headed Nuthatches, and Tufted Titmice. 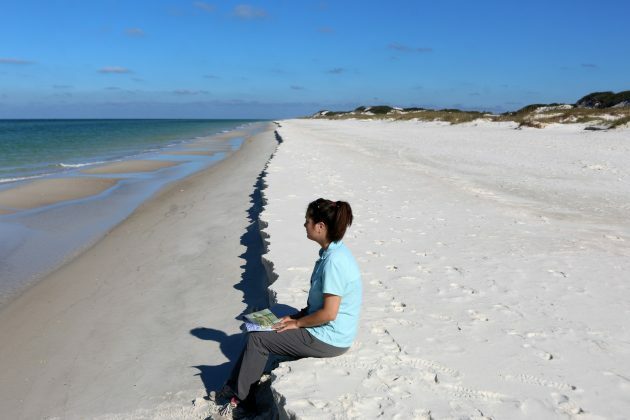 Taking a break along the Gulf of Mexico. The path arched towards the bay, where eight cabins faced the glimmering water. 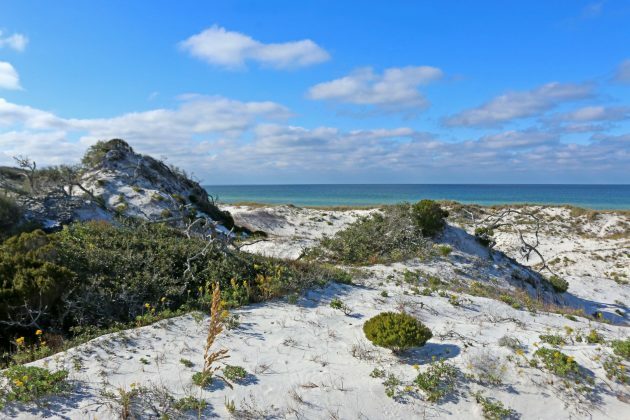 We didn’t have a permit to trace that shoreline, as it lay within a designated wilderness area, so we turned towards a wooden boardwalk leading up and over the dunes towards the Gulf. The dunes are huge. I’ve never seen sand dunes so tall, appearing like a mini-mountain range covered with golden flowers, sea oats, and scrubby trees. Finally I saw what dunes are supposed to look like when they’re not critically eroded or developed into second-homes or condos. When we reached the beach, we had a large expanse of sand on either side entirely to ourselves. B-e-a-utiful. A Willet walked slowly along the waves, while Sanderlings raced past on black legs looking for their own breakfasts. Brown Pelicans and Double-crested Cormorants flew near the surface. Over an hour passed as we explored, marveling at the variety of ecosystems and associated species on this beautiful peninsula. Though we only had until noon that day, I definitely want to return (my constant refrain), especially during the height of migration!